In 1994, the relatively unknown Dutch company, Fony, released a quirky little game called Eggbert for the MSX home computer. The system was never really all that popular outside Japan, but a few European countries (the Netherlands included) had quite a big fan base for the machine. 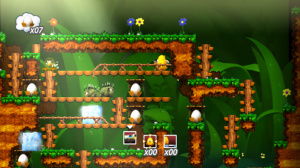 The game starred a little chicken called Eggbert, who had to travel through four different locations (forest, computer, sewer, and sea) and solve puzzles to get back his lost siblings (all still trapped inside their eggs). Sadly, this fine game was lost in the mists of time, and is even omitted from many MSX game lists dotted around the net. Years later some ex-Fony employees started their own company: Two Tribes. And what better way to celebrate than to remake the only game their previous company released? The game, now renamed Toki Tori, was released that same year (2002 in Europe) on the Game Boy Color. It was mostly the same as Eggbert, but with completely new levels (although they were in the same general locations, aside from one - the "computer" world was replaced by a "castle" world). Thankfully, the new version enjoyed more success than its predecessor and gained positive reviews across the board. Japanese giant Capcom published it, which serves as a testament to its quality. Unfortunately the Game Boy Color was in the process of being superseded by the shiny new Game Boy Advance, so the timing was far from ideal. But you can't keep a good chicken down, as the saying goes: Toki Tori is back again on WiiWare. The gameplay is unchanged - Toki Tori's mission is still to find all his missing siblings by solving puzzles. 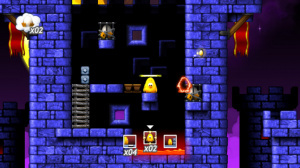 In this sense the game is a bit like a mix of the classics Lemmings and The Lost Vikings (Lode Runner is also comparable). 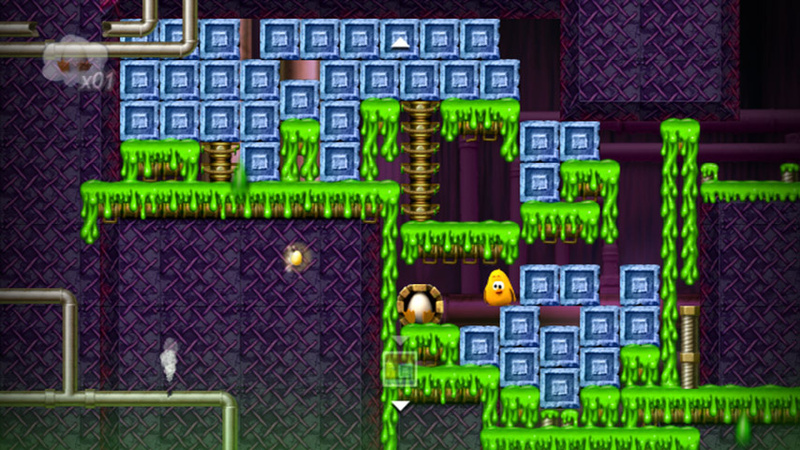 Toki Tori can freely walk around each stage, but that won't be enough to get all eggs. To accomplish that, you have a number of tools at your disposal (the number of each is preset for every stage). Using these, you can do things like build a bridge, create a block, freeze an enemy, or even teleport. 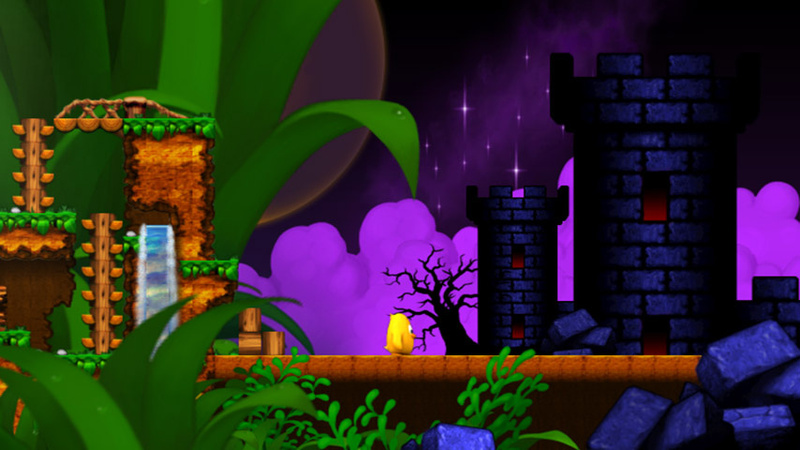 You can also pause the game and look around the whole stage in order to plan ahead; most levels have only one precise solution, which requires all items. 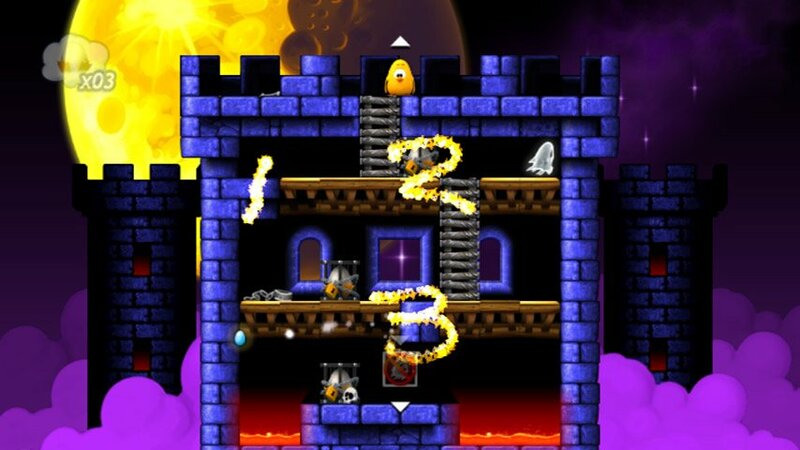 If an enemy touches you, you fall into spikes/lava, or you become otherwise unable to reach the remaining eggs, you have to restart the level. The game has the same four locations as in the GBC game (Forest Falls, Creepy Castle, Slimy Sewer and Bubble Barrage). This time, there are both new and old levels. The differences (aside from graphics) between each world aren't that big, though each world has its own "special" item, which you won't really use in any of the other worlds. Each world has 10 levels, after which you can do two things: move on to the next world, or stay and attempt the "hard" stages (7 in the first two worlds, 9 in the third, 6 in the last) . If you want to beat the game, you'll have to beat the hard stages eventually, but if you're not so confident you can do the rest of the normal stages first. There are also a few "item" stages where, once you get a new item, you get to learn how to use it. Between each world, there is a "transition" stage, which features no puzzles, but consists only of Toki Tori moving from the previous world to the next. Altogether, there are over 70 stages. If a stage is too hard, you can use a "Wildcard" to skip it -- you only have one of these though, so if you encounter another stage you can't solve, you'll have to solve the previous one first to get your Wildcard back! If you're truly stuck, Two Tribes mentions that you can contact them to get a hint. Graphics-wise the game is quite pleasing to the eye. All the characters are pre-rendered, which makes them look quite smooth, and all backgrounds appear to be hand-drawn. The main menu is a bit bare, but it does the job. 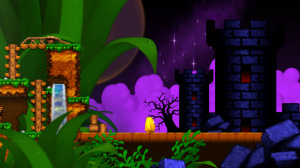 After selecting a level you will briefly see a picture of Toki Tori hiding in that level's setting: for example, if you select a castle stage, you will see him peeking out on the castle walls. As you get further into the game, Toki Tori will send postcards to your Wii Message Board, containing some humorous artwork of him in one of the four worlds, along with a short story. Another nice touch is that in Bubble Barrage, the underwater world, Toki Tori wears a snorkel. Two Tribes has opted to make use of the Wii remote's pointer in the control system which was a smart choice. The game only uses a few buttons. If you point at the screen and press A, Toki Tori moves to the location of the pointer. Pressing B makes him use an item, while left/right on the d-pad, or flicking the Wii remote left/right, cycles through items. You can also attach a nunchuk if you want to move around with an analogue stick instead, or you can use a Classic Controller. If you have a friend with you, he can grab a second Wii remote and draw hints, tips and tricks on the screen with the pointer. Music-wise the game is really quite amazing. The GBC game had a few great tunes, but all of them have been replaced by new, even better ones. Pretty much all of them are very catchy, and will definitely linger in your head for a while after playing the game. Each plays for several minutes before looping, and while the same general "theme" plays in every stage in a world, there are three or four variations, meaning you won't often hear exactly the same theme. We were a bit worried that Toki Tori on WiiWare was just to please the fans of the GBC game, but Two Tribes have really outdone themselves. 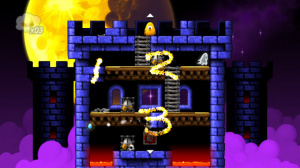 If you've already played the original, then you will probably blaze through the game in no time, as it has a lot of the old levels. But hey, it's been a fair few years since the GBC original -- it might be nice to revisit the game and get some new levels as a bonus. If you haven't played the original, well, you're in for a treat! At full price the GBC game was already worth it, but this version only costs 900 Wii Points, which really is a steal. Unfortunately I don't have money right now to spend on games. This will be my first download as soon as I get some though. I'm disappointed that WiiWare games take up a huge amount of space but hopefully this will push Nintendo into giving us a proper storage device for the Wii. Ive been staking up on points recentily. I will get this, putting it at 900 points is a great idea! Not my kind of game but it still looks pretty good. And 70 levels is alot for a WiiWare game, but I'm not saying that's a bad thing. Wow this game looks like a good buy! Im still in two minds about getting this. 70 levels is a lot for your money and I cant argue about the value of the game, but I feel that I would bore quickly of this game. It does seem a really well developed game though and I have some friends that would definately like this game. How long does it take to make it through the 70 levels? The screens look so simple that it looks like even 70 levels might not provide much play time. Just bought this before I saw this review! Glad to see that it holds up to my 20 minutes of initial impressions - It's Great! Looks like most WW games are about 300 blocks give or take. I really cannot wait for this, and 900 points is insanely low for something this great, I was prepared to pay as much as it cost. JZLAM: I'm about half done in 3 hours or so now, but I played the GBC game before, so I knew the solutions for all returning levels. If you're new to the game then I'm going to guess it will take you about 12 hours to beat everything. All PAL WiiWare games run in 60Hz I'm pretty sure (As long as you have your Wii set to 60Hz). Being a huge fan of Lemmings & The Lost Vikings & never playing this game, I will be getting it! I need a better... shall we say, incentive to convince me that this game is worth my time and points. Although I'm not getting it, it catches my interest, being the puzzle fan that I am. Was 900 Points a bad decision on their part? Drake that was an outstanding review! I can't wait for this game to come to the US. I loved the GBC title and I look forward to this one as well. I never tried the GBC original.. in fact, I had no idea it existed till now. Well, looks like I'll be keeping my points. Unless EarthBound comes out at the same time as or before this. Hell to the yes, I will be getting this game. 70 levels! No question of value here. This or Dr. Mario? (haven't played the originals of either). I bought this today along with 3 other wii ware titles. This game is pretty awesome. I like the idea of lemmings mixed with platform style gameplay. And the puzzles are quite fun to play through. I recommend this game to anyone who likes puzzle games really. I honestly wasent expecting much from this game. I guess I need to get this game now as it looks too good to pass up. Curse you WiiWare! I'm buying too many video games as it is! Good review. Second VC game I bought and not regretting it. Great fun game and I really dig the music. @KnucklesSonic8 sez... Was 900 Points a bad decision on their part? Nope. In fact it was good business sense. If the game only had a handful of levels (e.g. 10 levels) then the price would probably turn off most gamers. If the graphics were overly simplistic, the price would turn off most gamers. If the concept screamed "repetition! ", gamers would get turned off. I didn't think twice when I saw the 900 point price tag. Which tells me that Two Tribes understands their business extremely well. I must get this game when it comes to NA =D! Very nice review. good thing i have 5000 wii points not to mention the ones i already spent on lost winds and FFCCMLAAK lol i'm going wiiware crazy and giving all the developers a chance. What do you do once you've beaten the game though..? It seems like something you could complete in maybe 6-7 hrs of play (if you got really into it), then never touch again.. Are the puzzles on each stage really that different? It seems like after 10 or so stages you'd get the hang of it and the stages would become dull. Trust me, every stage will take you a while. @Chipmunk777 - I'd take Drake's word for it that this game has plenty of challenging gameplay that should take anyone who's never played the GBC game a good 8-10 hours to complete (put it this way, it took me about one and a half hours to complete the first ten levels of stage 1) For under 1000 points what more could you ask for? Well, I'll be getting this with Dr. Mario on monday now. It sounds great. I got this with Dr. Mario and find that together they really give more bang for the buck, simply because this game isn't easy, and will take a while. You can unlock harder levels once you've done the normal ones too. I'm currently playing it casually, as it's just a nice game to play in between other things. As far as gameplay is concerned it was well refined years ago, due to it being a remake. It's a great way of introducing a not so well-known game to the masses. I'm pretty sure they do. In the credits under "we would like to greet the following people" (Or something like that) it lists Eggbert (And Guybrush Threepwood, LeChuck, Cartman, Stan, Kyle, Kenny and others, haha). Well, I'm done (Actually I've still got the news to write up, but there's not much). Totally agree with the review, IMO it's one of your best Drake and IMO this is the best WW game out. Although FFCCMLAAK is VERY addictive, lol. My review looks crap after reading this, but I'm always worried that if I say the music's great that someone will leap at me, so I try to cater to both by saying "It's basic but it's still very good". And the same goes for graphics, because I can't stand getting barraged from graphic Fanboys. The graphics do look good... for a Game Boy Color game remade for the Wii. Obviously they don't look as good as LostWinds but I personally like seeing old games given modern graphics. I don't have any nostalgia for the GBC game but Toki Tori is the kind of game that appeals to me. I'd like to see more old games remade on WiiWare like TokiTori has been. Is it anything like Mario vs DK? I have that on GBA and I thought of it as soon as I saw a screenshot of this. Or maybe Lemmings? Yeah. kinda. except you don't have to save a number of mini-marios/lemmings like you do in those games. i guess its closest to Donkey Kong '94 in it being a puzzle/platformer (I'd love for DK94 to be modernised for WiiWare like this). When I read that this game could be played by two players I immediately thought it would be fun to play it with my girlfriend (I'm playing and she's giving clues, and vice versa). I downloaded the game and told her that she could help me with the second Wii Remote. She just thought that she wouldn't do it as she didn't see it important or anything like that. I asked her to at least try it. She tried and didn't think it would be of any use and found it pretty awkward to try to give hints like that. Fast forward to the castle stages... She had been watching me play from the beginning and her interest on the game just grew and grew. I had a serious problem with one of the levels and just couldn't beat it. She had an idea on how to clear the puzzle and tried to explain it to me. It was hard for her so she almost stood up to go in front of the TV to show what she meant. At that point she just "naturally" grabbed the Remote and draw her thoughts on the screen. It was EXACTLY how the developers had thought it! I just had a huge feeling of JOY from the realization of it and the greatness of Toki Tori just kept on growing. If I could meet the people behind Two Tribes I would shake their hands and say a huge "thank you" for giving us top notch entertainment! Luv the game, And for 900 W.P's /DAMN(Goed gedaan jongens)!!! Great review Drake, I think I'll get this as my next WiiWare games. How about you give Two Tribes a ring to see if they can gift it to me? can you get Two Tribes to gift it to me too? and i'd appreciate it if Nintendo would gift me Dr. Mario. 290 blocks that hurts. I have 395 blocks left but if I get this I can't get anything else and the only VC games I have left are my favorite classics! DAMN YOU NINTENDO!!!!!!!!!!!!!!!!!!!!! Thanks guys for all the positive feedback on the game, that's really appreciated! This game is a good game, I'm playing it right now. I like it, I never play this game before neither onGameboy Color. which really is a steal. I was stuck on 2-10 for quite a while, so I quit & started watching TV. About 30 minutes later, completely out of the blue, I had a "eureka" moment, quickly turned on my Wii and completed the level instantly. I think that says a lot about how engrossing the game is, because the back of my mind was working on the solution all that time. I'd say it's a cross between Donkey Kong on the Game Boy (in regard to level design) and a simplified Zack & Wiki (what with the items). Everyone should buy this! As a Game Boy Color fanatic back when I was a senior in high school, it always royally aggravated me that over half of the shelf space at Walmart was always filled up with Pokemon games. I finally bought a whole glut of games at ToysRus when I found out that the Game Boy color was being discontinued, however, like most everybody else around here, I missed out on this title. I will probably download this when it releases; however storage space on my Wii is really becoming an issue by now. Screw what I said on the game page. I'm getting this game for sure!!! Thank you for the well-written review. It certainly helped a strong puzzle fan like myself. Only gripe is the size but I don't care about that atm. I'll cross that bridge when I get there if need be. Oh and Jazeem, hearing a fellow HUGE puzzle fan say that this game is truly challenging, that it's "heaven" and that you THOROUGHLY RECOMMEND it is truly heartwarming to see! Can't wait for Monday to hit! Hope I have a Points Card by then. This is gonna be a cool game to grab on monday and i wanna try it out too, haha. can get pretty difficult, but i think it's the best wiiware game so far in europe. Crap....if only it wasnt so big...after this and one more wiiware game, my Wii will be full...TIME TO DIE, NINTENDO CHANNEL!!! This game kinda reminds me of Load Runner some how. damn it, between this and two other WiiWare games, I am already down to 83 blocks ... again after deleting a 2 N64 games, 2 Genesis games, 1 Turbografx game, 5 NES games, and 1 SNES game. 1000 Wii points and the 300 some blocks is a bargain for this game. It's highly polished, has a great learning curve that never leaves you bored or wondering WTH is going on, and has more hours of gameplay than many $50 games. The music and graphics are pretty good too. It actually kinda reminds me of Zack and Wiki, with a dash of Lemmings or Lost Vikings. So get it everyone! It's a great game! Especially if you love puzzler platformers. All kinds of fun to be had here! I'm immensely pleased with how this game turned out. I wonder if I should get this. This sounds interesting. It seems like a good game with loads of variety, and Drake's review made the game sound awesome, but will the game be too hard for me? Too hard? It wil require some thought, but you should be able to beat at least the first half of the game with no problem (not including the evil hard levels). I say the first half, because I can confirm that, having gone that far. Just downloaded this game today, and I will confirm the review, the game really is great! I haven't tried multiplayer yet since everybody I know is busy this week, but if nothing else, the singleplayer is great. I really like how the puzzles, even if some really difficult to solve makes sense. Nothing of the "Find the torch underwater then flame the palm tree so the rubber duck can fall on the crocodile and make him fetch you the key" sort of thing, which is great! -- 5 stars, no doubt. Final_Starman: I love MVDK. It was a great puzzle game. Toki Tori is such an awesome game, I'm so glad I gave it a try!! I've been playing it a lot lately and I've gotten to Bubble Barrage (5). Everytime I'm stuck, I don't rely on help. I figure it out myself, in the end. Trust me. A lot of the stages WILL get you stuck, no doubt. The Slime World is where the difficulty amps up. Even in Creepy Castle, there's evidence of this, as the difficulty starts to increase but it increases much more notably in the 3rd World. This game ROCKS! It's truly heartwarming to see such a great game being the avid puzzler fan that I am!! I am honestly REALLY REALLY hoping they make a sequel. I'd buy it in an instant!!! Thank you, Two Tribes. Thank you for making the heart of a HUGE puzzler fan truly happy!!! And yes, the Hard stages WILL have you on edge. I KNOW how to beat a very difficult Forest Falls Hard stage (figured it out on my own) but it's all in the timing. I've beaten about.. ohh... 80% of the game, I'd say and I still have a lot to do, including Hard stages I can't seem to figure out. The game is just so deceptively challenging and it does my heart good!!! @knuckles dont space your comment out please But it seems you are a lil past me (I am on puzzle 3-4) BTW have you reg'd me in DM? Cause I have. Dr. Mario = Dunno. Wii Message me. Oh and again sorry about the above comment. I REALLY love Toki Tori. It's an awesome game and was SO worth 1000 Points. I downloaded this game yesterday, and it's really amazing! The two player drawing feature reminded me of Zack & Wiki, but it doesnt really work for us...talking is usually easier. That doesnt really matter though, this is definitely the best Wiiware game. The puzzles can get pretty hard, but you can work it out. Plus, the game only costs 10 bucks, and it is better than some $50 games! Lemmings meets Lost Vikings meets Donkey Kong '94 for the Game Boy. Nice visuals, solid gameplay, awesome music and good play time, all for 900 wii points. My first and only wiiware game till now (i skipped lostwinds because of its low play time) and i'm not disappointed at all. I suggest any puzzle game fan who's into 2D old school games to dive into this one. I downloaded this game by accident. It took, like 3 hours (I'm exaggerating, but it sure felt like that.) for it to load to my wii, but man am I glad I got it! A great, smartly-designed puzzler imo. I can't believe I overlooked this game so nonchalantly when it first came out! I haven't played since I beat the main levels, but I'll get to those hard levels eventually! I give it a solid 9/10 too! btw At the end, Toki Tori fries a bunch of eggs in a giant pan, in front of a bunch of happy little baby chicks. How disturbing! Oh, and, uh, to the people at the top of the page, this game costs 1000 points, not 900. I bought it tonight. I'm very happy with it. I hope to get this eventually, I loved the GBC game. I suppose I would be frowned upon if I asked somebody to gift it to me? Oh, well. A 9, huh? That's tied with FFCC and LostWinds, both of which I'm probably never going to play. TokiTori and LostWinds are the best games for WiiWare so far! Buy it! 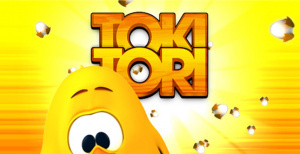 Everybody buy Toki Tori so we can bring Toki Tori back! Toki Tori was great, working on the Hard Levels, and man they arent kidding. Toki Tori rules, I have 7 more hard levels to go, but they are crazy, so I'm resting my brain for a while and I'll comeback later, great game, really huge, everybody buy buy buy!!! Please buy toki tori everyone, so it can come back on the top 20 chart! I would have downloaded this sooner than I did had I known what type of game it is. It strikes me as kind of a cross between Lode Runner and Lemmings. Interesting historical details in the review. I downloaded this in June. It was my first WiiWare title, and it still is. This game is perfect. It is addictingly fun! I am in the last world, and I will say that I don't play it every second, but I do play it when I can. It combines fun and using your brain. A perfect mix. What really shocked me was that it didn't make it to far up in the popular titles list. Now it is off the list. I don't see why people wouldn't download this. I highly recommend giving this a download if you have enough room on your Wii, and if you don't, well, make room! I placed this game in my wiiware´s wishlist. You know, I guess I'm gonna be the odd man out now and say that I wasn't really all that impressed with this game. I found the music kind of annoyingly sunny (kept it on mute most of the time), the level designs repetitive (it's basically the same backdrop for each stage of each level with different traps and puzzles) and the game itself was just kinda "meh" for me. It wasn't HORRIBLE, but far from a 9/10, IMO. I'd rate this a 7 at best. boo. i have 900 wii points. i was going to pick this up, but then realized it's only 900 points for the EU. Right now I'm on the last world of this game. I haven't had to use any walkthroughs so far, but each level takes me about 20-30 minutes to figure out. This and World of Goo are my favorite WiiWare games. I think it definitely deserves 9/10. @Drake: What is PAL version? I have saw this on the Nintendo Channel, but I was never intrested in this title. @megaboomface2 - on the sauce more like. @98 PAL has to do with the European version. Great game! This review convinced me to get it, and Ive never regretted getting it. 8.5/10 in my opinion (with respect to the slightly higher NA price point).